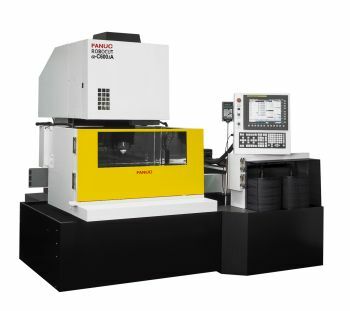 Methods Machine Tools, Inc. has introduced the new FANUC RoboCut a-CiA Series including the C400iA and C600iA Wire EDMs. These EDM machines include several important upgrades including the new FANUC 31iWB Control which is loaded with new features for improved accuracy and finish, especially in high-taper 4-Axis cutting. The Ai Pulse Control II now offers better straightness and faster cutting speeds for both roughing and finishing in interrupted cuts. And the world-renowned FANUC Auto-Threader offers enhanced reliability, including when threading soft wire while submerged and in the cutting gap. "The C400iA and C600iA lines provide our EDM customers with the latest in proven FANUC technology with major upgrades to optimize productivity," said Mr. Stephen Bond, National Sales Manager for FANUC RoboDrill, RoboCut & EDM Products, Methods Machine Tools, Inc. The new FANUC Wire EDM Series also features several new control enhancements designed to reduce overall operational costs by monitoring electrical component usage for minimizing power consumption. Costs are further reduced with the new "Eco Mode" which reduces wire consumption up to 30%. And the PCD power supply has been upgraded to allow for more efficient burning in difficult-to-cut materials such as CBN and some carbon fibers. Also, cutting technology is available for machining complex, detailed graphite electrodes up to 6 inches thick with a super fine finish. Significant upgrades have been made to RoboCut Link i cut monitor software that is standard on RoboCut machines for monitoring and operating the machine remotely. A new, extremely user-friendly interface is now available for Apple iPad's and other remote smart devices. Like the FANUC iE and iD EDMs, the new FANUC RoboCut C400iA and C600iA Wire EDMs are capable of manufacturing complex components and offer seven-axis simultaneous machining as an option. The a-CiA Series is ideal for machining a wide range of materials including cobalt-chrome, high-nickel alloys and titanium often found in challenging applications such as aerospace, medical and military.